The Battle of Third Ypres, having started reasonably successfully, then degenerated into the commonly named Battle of Passchendaele and ended in the bottomless mud of November. The name has become synonymous for waste of life and pointless orders to continue the attack irrespective of the ground conditions. The British and Imperial casualties reached 245,000; German figures are not known. Both sides "settled down" in the mud fields to try to survive through the winter. Neither side had "won"; but both sides would carry the memory of the battle into another generation and another war. 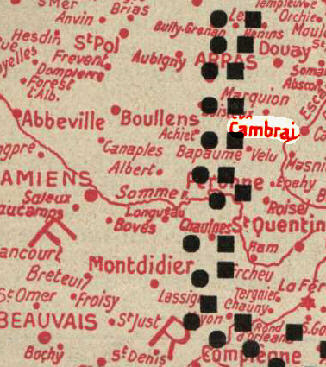 To the south of Ypres and east of Arras the Battle of Cambrai was being formulated by the British staff. The heavily fortified countryside was part of the Hindenburg Line and was being used as a quiet area for German troops to recover from the Passchendaele fighting. Part of the proposed battlefront included the vast, dry bed of the uncompleted Canal du Nord. Finally, in November the Battle of Cambrai was launched under the leadership of General Sir Julian Byng, now commanding 3rd Army. Originally conceived as a large-scale trench raid, it expanded into history's first significany tank battle. The ground was perfect, rolling, firm and reasonably flat and on 20th November at 0620 in the misty dawn, 376 fighting tanks rolled into action. Their supporting infantry was trained for close cooperation with these very slow moving 27-ton giants. A further 98 were also in action with a variety of uses, including 32 equipped with huge grapnels (like mighty anchors) for pulling the massive barbed wire entanglements to pieces, and number carrying huge fascines, bundles of brushwood chained tightly together, ready to be dropped into the German trenches to allow the tanks to pass over. One of the first American units involved in combat on the Western Front was drawn into the Battle of Cambrai. The 11th U.S. Engineering Regiment, which specialized in railroad repair, was caught on the Cambrai battlefield when the Germans mounted a surprise counteroffensive. By nightfall, 3rd Army had broken the line to a depth of over four miles on a wide front. Tank losses on this day were 65 written off, 71 more with mechanical problems and 43 ditched. Despite heroic efforts by the crews, mechanical unreliability and pure human exhaustion, the number of available tanks dropped during the following days, and the early successes began to fade away, with increasing pressure on the infantry. Unfortunately, there were two German strongpoints that could not be taken despite desperate fighting at first or in future days, one at Flesquieres and another the great mass of Bourlon Wood and its sleepy sprawling village. There was also a deep valley at Banteux from which massive German counterattack formations were launched on November 30th. By December 5th, the British were roughly back in their original lines, as were the Germans, and the battle petered out. Tanks had certainly proved their worth and also their weakness in action, and the British took these lessons to heart. That, however, was for next year. Born in Collinas, Sardinia in 1898 a member of the Sassari Brigade, a Sardinian infantry unit nicknamed the "Dimonios" ("Demons" in the island's dialect), Justin Tuveri died on October 5th. Tuveri, who spent most of his life in France, remained active despite his advanced age, pruning trees and cleaning out rain gutters at 90 and driving until age 98, according to the newspaper, Le Monde. He died Oct. 5 at his home in the southern French resort town of St. Tropez, the mayor's office said. Although Tuveri became a French citizen in 1940, he did not figure on the French Defense Ministry's list of surviving veterans from the 1914-18 war because he had fought for Italy. Only two French veterans from the war are still alive, according to the ministry. This is a massive novel reminiscent of those produced by James Michener. 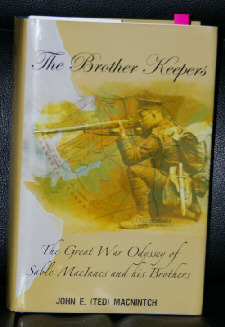 The author, though the eyes of Sable MacInnes one of five brothers, sons of an itinerant Baptist preacher, reveals in detail the course of Canadian participation in World War One. The first ten chapters of the book are devoted to the family life of the brothers as they grow up in rural Nova Scotia and to the culture of the Maritime Provinces. The remaining chapters trace Canada's entry into the Great War and the campaigns of the Canadian Corps on the Western Front. MacNintch's fictional brothers are involved in one way or another in all the major actions of the Canadian Corps: Ypres, the Somme, Passchendaele and the final push to Mons. One brother, who joins the navy, is present at Halifax when the French ammunition ship Mont Blanc explodes there in 1917, leveling half the city. All of this narrative is supported by excellent maps and historically accurate descriptions of the battles, as well as of Canadian politics of the times, based on careful research extending from unit histories to family papers, and a thorough study of the literature and history of the conflict. There are excellent sketches of life in the trenches, relations between Canadians and their allies, as well the weapons (including the Ross rifle) Canadian soldiers fought with. Appendices cover the Canadian Corps (CEF) order of battle in 1917 and contain a detailed glossary of contemporary military slang and terms used in the CEF. Authenticity is enhanced by quotations - set off in italics - from contemporary documents and historical studies. As most historians of World War One know, the Canadian Corps of five divisions (one of them stationed in England to train replacements) was as large as any of the five British armies on the Western Front and had a complement of artillery larger than most armies. After mid-1917, it was totally under Canadian command, with Lt. General (later Sir Arthur) Currie heading up an experienced, stable and expert staff, many of whom went on lead the Canadian Army in WWII. The Canadian Corps has been described by several historians as the "shock troops" of the British Empire. Readers of this historical novel will discover why. The author's intent, clearly stated in his preface, is to place Canada's part in the Great War in the proper context with that of the United States. In fact, however, Canada's role need not be compared with that of Woodrow Wilson's America. It stands on its own as a major contribution to Allied victory. Last month we recommended an opinion piece by Dr. Thomas Sowell of the Hoover Institution: "Wilsonian No More"
Regular Trip-Wire contributor Len Shurtleff, sent this response to Dr. Sowell's main point. We suggest you read the article first if you haven't done so earlier. I enjoy reading Sowell because he comes at current issues with a fresh perspective and some useful historical context. Here, however, he is wrong to blame Wilson alone for the rise of self-determination as a rallying cry for nationalists. The seeds of rampant nationalism existed in the multi-ethnic Ottoman and Austro-Hungarian Empires even before the war. Armenian, Greek and other Christian subjects of the Ottoman Empire were restive. Indeed, Greece, Serbia, Rumania, Bulgaria and Montenegro had already hived off from the Ottomans in the 19th century. Albania became independent during WWI. France, Italy and England conspired for tactical and imperial reasons in 1915 and 1916 to promise bits of both the Ottoman and Austro-Hungarian empires to each other and to Italy, Rumania, Emir Fisal in Arabia and King Peter of Serbia even before the war was over. The post-war peace treaties largely ratified these secret agreements despite Wilson's active opposition to many of them during the Paris peace negotiations among the Allies. All of these these actions predated Wilson's Fourteen Points speech of January 1918. Indeed, London and Paris were horrified by the breadth and scope of the Fourteen Points. In one sense, Wilson was only recognizing a fact of political life in Europe and the Near East: the thirst for self-government. L.S. When you want to know more about the World War One movie you've just seen there are a variety of sources to access for further information. The online Internet Move Database (imdb.com) can be used but it is not always reliable. One screenwriter once told me it listed him as dying the year before he won the Academy award for Best Screenplay! Still, it's a good place to start for basic research on a particular title. I find that the external reviews links are often valuable sources of information. Wikipedia.org is another recommended online source that allows a reader to follow up with internal links to other stubs on cast, director and themes. I often browse through online auction catalogues for rare images of movie posters, stills, etc. that can saved for future articles. But, at heart, I'm a book person and over the years there are some books and authors that I rely on to provide the additional information and insight that often completes the enjoyment and understanding of a particular movie. Several years ago, I had to the pleasure to participate in a New York Military Affairs Symposium panel discussion on Celluloid Wars: American Feature Films and The Experience of War. One of the speakers was Lawrence H. Suid. Currently, Larry Suid has three books of particular interest in print and I can recommend all of them. While they do not focus just on World War One movies they do provide a great deal of information on the production of many titles of interest. Larry's books are: Guts & Glory: The Making of the American Military Image in Film, Sailing on the Silver Screen: Hollywood and the U.S. Navy and Stars and Stripes on Screen: A Comprehensive Guide to Portrayals of American Military on Film (with Dolores Haverstick). Celluloid Wings: The Impact of Movies on Aviation by James H. Farmer is currently out of print but used copies are readily available. His information on the production of Wings, The Dawn Patrol and Hell's Angels are of special interest to WWI aviation movie fans. The Cinema of Adventure, Romance & Terror edited by George E. Turner contains well-written and well-illustrated articles from the archives of American Cinematographer magazine. Of particular interest are the chapters on Wings, All Quiet on the Western Front, The Lost Patrol and The Black Cat. I'm proud to have an autographed copy of Kevin Brownlow's The War, The West, And The Wilderness in my collection. Brownlow is one of the foremost living film historians and while a number of his books cover World War One movies in passing; this title devotes a full third of the book to the making of classic World War One movies, both features and documentaries. The acclaimed television series Hollywood: A Celebration of American Silent Film was based on Brownlow's writings and interviews. The episode "Hollywood Goes To War" is highly recommended. Andrew Kelly specializes in the movies on The Great War. All Quiet On The Western Front: the Story of a Film concentrates on just one title covering not just the production but also the ensuing censorship controversies, as well. Cinema and the Great War covers the British, American, German and French anti-war cinema dealing with the First World War. Kelly has an essay, "The Greatness and Continuing Significance of All Quiet on the Western Front" in The War Film, edited by Robert Eberwein. I often use Brassey's Guide to War Films by Alun Evans for its comprehensive listings. Chapters and information of World War One movies can be found in History Goes To The Movies by Joseph Roquemore, The Hollywood History of the World by George MacDonald Fraser, History by Hollywood by Robert Brent Toplin, The Columbia Companion To American History on Film edited by Peter C. Rollins, Past Imperfect: History According to the Movies, general editor, Mark C. Carnes, The Great War Films by Lawrence J. Quirk and The Encyclopedia of War Movies by Robert Davenport. 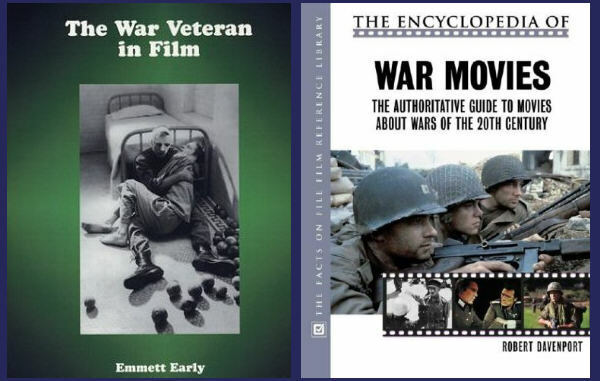 The War Veteran in Film by Emmett Early covers 125 movies that feature the war veteran from the Trojan War to the Vietnam War. Sixteen World War One movies are covered including Heroes For Sale, Johnny Got His Gun and The Razor's Edge. Celluloid Soldiers: Warner Bros.'s Campaign Against Nazism by Michael E. Birdwell covers the making of Sergeant York and Alvin York's personal conversion from isolationism to interventionism in fascinating detail. Film And The First World War, edited by Karel Dibbets and Bert Hogenkamp is based on a selection of papers presented at the Fifteenth Conference of the International Association for Media and History held in Amsterdam in 1993. Both cultural historians and film historians provide more than twenty contributions offering an unusual mix of views. Film Front Weimar: Representations of the First World War in German Films of the Weimar Period (1919-1933) by Bernadette Kester analyzes 25 films and shows how Germany tried to reconcile the horrendous experiences of the war through cinema. If all you know about this period is Westfront 1918 and want to know more, this title is recommended. The First World War And Popular Cinema 1914 To The Present edited by Michael Paris offers essays covering movies from Britain, Australia, Canada, France, the United States, Italy, Germany, Poland, Austria and Russia. Many of the titles discussed are relatively unknown to audiences in the United States making this title especially appealing to those interested in expanding their cinema horizons. Hollywood's World War I: Motion Picture Images edited by Peter C. Rollins and John E. O'Connor studies feature films and documentaries. Of particular interest are the chapters on the CBS documentary series on World War One and the making of the documentary The Moving Picture Boys in the Great War. This book is another one of my personal favorites for its comprehensive coverage of both well-known and little-known titles. These are just some of the titles I use on a regular basis. Of course, some titles require cross referencing and additional research. The Vanishing American (1925) is a western, a war film and a war veteran film. The Roaring Twenties (1939) is a gangster film, a war film and also a war veteran film. The following are thanked for their contributions to this issue of the Trip-Wire: Tom Jones, Eric Harvey, Tony Langley, Jeff Milman, Christina Holstein, Tony Noyes, Andy Melomet, Kimball Worcester, Bob Denison, Bob Ford and Len Shurtleff. Until next month, your editor, Mike Hanlon.